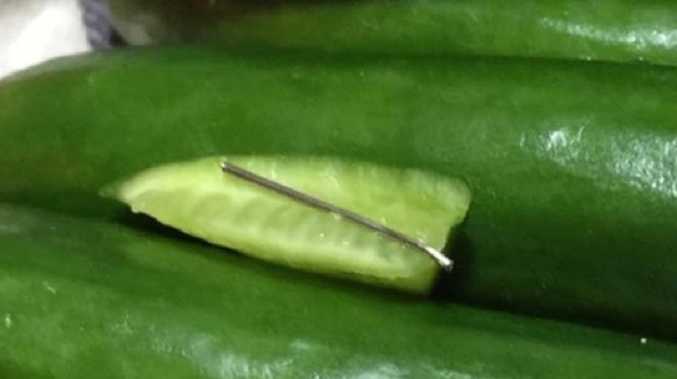 A MELBOURNE mother has described her son's distress after allegedly finding a wire in a cucumber as police confirm ongoing "copycat" cases in the wake of the fruit contamination crisis. It comes amid a national crisis that has seen saboteurs insert metal objects in fruits across five Australian states. Police have received reports of more than 100 alleged cases of pins and needles being found in strawberries, bananas and mangoes, since the first incident was recorded in Queensland on September 9. Authorities believe the majority of incidents have been carried out by copycats. Maria, who didn't provide her last name, today told 3AW's Tom Elliot that her 12-year-old son had almost swallowed a "piece of thick wire" hidden inside a cucumber last night. She said she bought the fruit at Woolworths Devon Plaza in Doncaster East before chopping it up for her son to eat. "As soon as he came out of his room he said: 'Mum I found a needle in it'," Maria said. "I said: 'come on stop joking' and he goes: 'Mum, I'm not joking' and showed it to me. "I was just beside myself … It looked as though it had been snapped with some pliers … it was curled on one end of it." Maria said her son was "pricked" by the wire but that it "didn't penetrate him". "He was so upset … he said, 'Mum if I had swallowed it could I have died?'" she said. "He was just so worried … he was panicking. "I just feel I don't know what the world is coming to … (I'm) too scared to buy food, (I) don't know what to do anymore." Maria said she reported the incident to the store where the cucumber was purchased and to police. 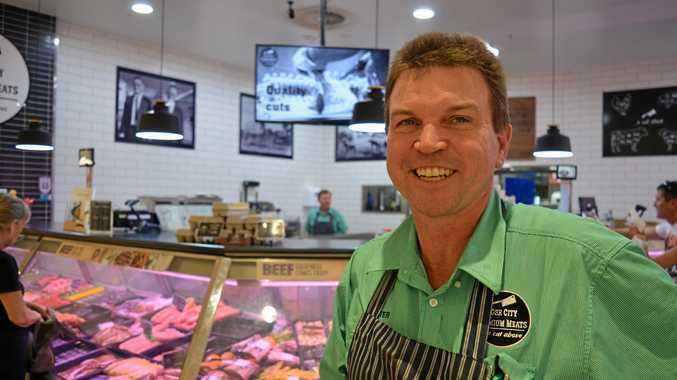 A Woolworths spokesperson told news.com.au the company was "aware of the customer report and understands police are looking into it". "We'll work closely with our supplier to assist the police as needed," the spokesperson said. A nationwide scare involving the piercing of various fruits with sewing needles has prompted a series of supermarket recalls, and saw some stores in New Zealand temporarily ban the sale of Australian strawberries. A Victoria Police spokesperson told news.com.au they were investigating "multiple reports of contaminated fruit" including the alleged spiked cucumber. "We can confirm we are investigating numerous incidents of what appears to be 'copycat' offending with reports of various other types of fruit contaminated across the state," the spokesperson said. "We urge the public to report any similar cases of fruit contamination to their local police." Anyone found to be contaminating food products can be charged with a serious indictable offence and faces up to 15 years in jail.